Christy Rochelle Bressette — Neta Noo-Ke Kwe (Hard-Working-Woman) — is an Anishinabe parent, student, teacher and community member of Kettle and Stony Point First Nation. In 2008, she defended her doctoral dissertation, Understanding Success in Community First Nation Education Through Anishinabe Meno-Bimaadziwin Action Research, making her the first Indigenous student at Western University to earn a PhD in educational studies. Indigenous stories have been invaluable in revealing information not available from other sources, and this is especially true when we consider the ancient stories about the early flint trade. The Anishinabek were, and continue to be, an oral-based society that preserves their history, culture, traditions and beliefs through stories, legends, ceremonies and songs. My grandfather (mishoomis), David Bressette, was a storyteller too, and each story he shared possessed important teachings and lessons, if the listener was careful to listen and learn. The history of the Anishinabek people of Wiiwkwedong begins long before the first contact with European settlers in the 16th century. Long before colonization, there were four groups of Indigenous Peoples who lived in what is now southwestern Ontario: the Anishinabek, the Huron, the Neutrals and the Haudenosaunee. Mishoomis told me many times that our people had always been here since time immemorial — and the study of ancient arrowheads confirms this. In fact, archeologists surmise that people came to occupy southwestern Ontario after the glaciers melted around 9000 BC. These first inhabitants were our ancestors who had, indeed, been here since time immemorial. Meadowood points from southern Ontario, dating from 900-500 BCE. As a child growing up in Wiiwkwedong, I would walk behind mishoomis and his tractor as he disked the ground after a rainfall because I knew that I would find freshly unearthed arrowheads in the furrows. The rain washed the dirt off the flint, making arrowheads easier to find. To me, it was exhilarating to witness the first flash of sunlight announce the emergence of an ancient arrowhead that had been hidden underground for more than 10,000 years. The arrowheads, skilfully crafted by ancient flint-knappers (craftspeople), differed in radiance and colour. Some arrowheads were white or light grey, while others were blue-grey or pink. They were covered by a patina — a film that gradually appears on some surfaces when exposed to oxygen — and they appeared to originate from the Early Woodland archeological period (1000 BC-300 BC). Elder Bruce George from Wiiwkwedong, a longtime collector of arrowheads, references long-circulated Oral Traditions that early people indeed came here to acquire our flint as it was superior in quality and readily accessible from the outcrops (exposed rock) left behind after the retreat of the glaciers. The close proximity of outcrops to water made the flint easier to transport. Anthropologist Liam Richard Browne’s research shows that from a geological and anthropological perspective, Kettle Point chert, a flint-like form of quartz, was the only natural outcrop of its kind around Lake Huron and was used by different Indigenous groups for thousands of years. It is the pride of our community that the commodity of Wiiwkwedong flint positioned us as a frequent stop on many Indigenous trade routes, linking us to many early Indigenous communities. Some researchers assert that flint-based technology provided us the equivalence of an advanced steel industry, while other communities at the time were limited to using stone. Evidenced by the trail of artifacts discovered throughout southern Ontario, archeologists can confirm Indigenous Oral Traditions about widespread flint trade and suggest that Indigenous groups tracked caribou herds to the north in the summer and south in the winter. Such discoveries confirm the widespread range and trade of flint. Archeological findings confirm the existence of a vast trading network that covered a significant portion of northeastern North America throughout the Early Woodland period. At this time, there was an emergence of stone toolmaking by highly skilled craftsmen known as flint-knappers. The arrowheads that have been found suggest that they were specially crafted by a select few and then traded. It was apparent that knappers laboured to support the needs of their families and entire communities. An enduring commitment to family is the legacy of our ancestors, evident from the type of grave goods that have been discovered from this time period. According to mishoomis, the flint trade provided early people with opportunities to meet one another, which likely led to the development of new family dynamics, cultural exchange and perhaps political alliances. In his research, Peter Storck (archeologist and senior curator emeritus at the Royal Ontario Museum) asserts that the flint trade indeed influenced the social interaction between early peoples. 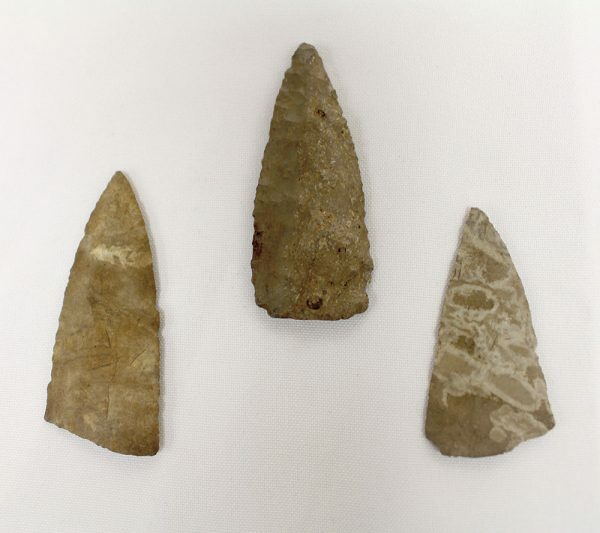 He further observes that by examining the types of imported chert (flint) in a given area, we can learn more about how Indigenous groups travelled and traded and what kinds of social relationships they had with other groups. Mishoomis showed me that careful analysis of the different types and purposes of arrowheads can reveal many stories and realities about ancient times, such as information about the environment, the weather, where people lived, the type of game available and how it was hunted and the social and political climate. As it turns out, anthropological discoveries can indeed help to confirm many aspects of the lifestyles and realities of peoples. Indigenous Oral Traditions, sustained over thousands of years, reveal that our ancestors respected the environment, and their enduring wisdom continues to teach us still today.